1. 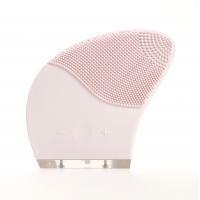 Deep Cleansing Brush: Tiny and softer bristles to flush and dislodge oil and debris that clogs pores, deeply clean skin. 2. 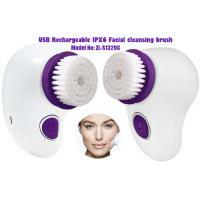 Exfoliated Brush: Tiny and high tenacity Nylon bristles to exfoliate dead skin effectively. 3. With 2 varying levels of rotating speed, you can use it according to your specific skin concerns. Designed for fragile or acne skin, Speed 1(300rpm) is delicate enough for even very sensitive skin conditions. Speed 2(500rpm) is developed for oily and thicker cuticle skin. 4. 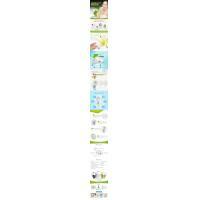 Improves healthy-looking skin in just 1 minute: Skin Tone, Pores, Smoothness, and Brightness. 5. Waterproof (IPX5) and Unique streamline design. 6. Breathable protective cover with 18 mini holes to prevent bacterial growth. 7. Powered by 2xAAA batteries, more portable and safe of use. 3.Fixed desired brush head on axis of rotation. 1.Apply cleansing foam on hands, moistened brush head or apply cleanser directly to moistened skin. 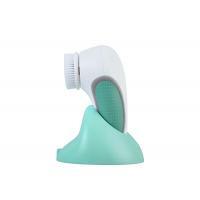 2.Push the on/off button to turn on your cleansing brush, select desired intensity of use. 6.Wipe drops off with a clean, dry towel, coat the protective cover, and then store in a ventilated place. 2.Please keep your hands dry when you change the batteries. 3.The product is waterproof but could not soak in the water long time. 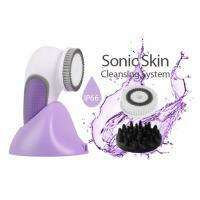 4.Cleanser with or without foam is available. 6.Please coat the protective cover after use, and store in a ventilated place. Batteries must be removed from the equipment if not used for a long time. 7.Keep out of the reach of young children. Shenzhen Trendz Technology Co., Ltd established in the year of 2011, is a professional manufacturer engaged in the research, development, production, sale and service of portable beauty care devices. With the idea of “enjoy life, enjoy beauty”, we supply home use eye wrinkle eraser, facial cleansing brush, sonic skin scrubber, photon acne remover and etc. Our factory covers over 4,000sqm, with 4 production lines and 143 staff in workshop. In recent years, our company has introduced a series of advanced testing equipment, including transport simulation machine, salt spray test chamber, high low temperature machine... . In addition, we have obtained ISO9001:2008, SMETA, CE, RoHS, FCC, FDA certificates. Depending on high quality products and thoughtful customer service, our brand “ZLIME” is warmly welcomed by clients. In China, our distributors spread over in all provinces. In abroad markets, we export to Germany, Spain, France, Italy, Japan, Korea... Famous brand we work with like Avon, Jurlique, Pechoin, Amorepacific, Watsons and etc.